Muni's proposed budget cuts will trim back service, but how about a definite guarantee of worse service starting immediately? That's right folks, just this morning, the inbound J-Church collided with a F-Market Milan historic streetcar in route to start it's run. While the metro cars are built strong and can take a beating, the old F-Market historic fleet are a lot more fragile. Whenever they get into a serious collision, it's practically the end of the streetcar until the city can dish-up the money to make the repairs necessary to get it back to work. So that means one less F-Market streetcar on our streets. Great, a guaranteed service cut for the failing agency. Infrequent service; from cars just seconds apart to over 20 minute waits. Long lines to board due to the tourists paying cash and asking to break a $5. Not moving to the back of the car. Skipping stops when the first half of the car is full, but the other half is not. A portion of the streetcars don't even go the Castro. Just the Ferry Building to Wharf route. So by having another streetcar out of service, more of us will suffer. Muni hardly provides diesel buses to cover the route, except for major holiday weekends and events (e.g. 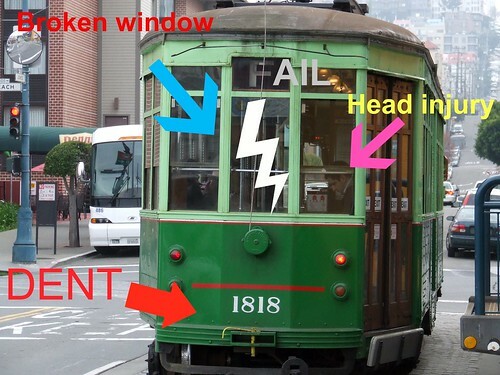 Fleet Week), so one less operating historic streetcar means less service for you and me. I feel a migraine coming. Wouldn't it be nice if Muni could invest into new low floor light rail cars that could also run alongside the historic streetcars? While the line has a notorious reputation, tons of people ride the line and having more cars running on the rails can help gain more popularity with the line. many of the problems with the F line have to do with the fact that market street doesn't really priortized buses or the F line very well. the experiments in calming have helped somewhat, but until you have a lane that's just buses and no cars and no weirdos, it's always going to be a problem. the F line historic cars are maintained by MSR, which is not a city agency, btw. True about the MSR fact. But I'd expect Muni to pay with our tax dollars for that accident; it shouldn't come out of the pockets of the MSR folks. Didn't something similar happened around there three or four years ago? I recall the operator was fired and the historic streetcar that was involved in the accident was permanently removed from service.